Chuck Sperrys new book Helikon gathers together his masterfully screen printed wood panel series of contemporary-classical muses: work inspired by the spirit of the modern rock poster, graffiti, and the utopian ethos of 1960s psychedelia. Helikon presents 36 sumptuously photographed Sperrys paired with the prose or poem from Homer to Nick Cave that inspired each. Over a dozen photos by Shaun Roberts give the reader an intimate portrait of the artist at work. 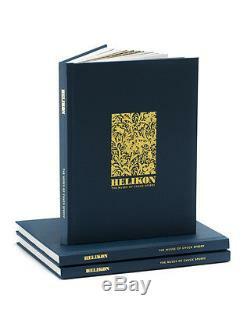 Helikon is Sperrys beautifully designed, hand-bound coda to 5 years of artwork devoted to the perennial theme of Orphic Dionysian mysteries. Forward by New York Times bestselling author, Charles Bock, Beautiful Children, Alice & Oliver (Random House), and Best of NYC Culture 2016, Village Voice. 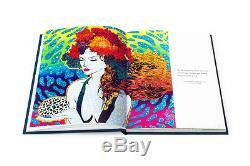 Hardback Limited Edition of 500. 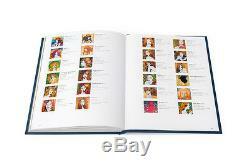 9 x 12 inches / 136 pages. 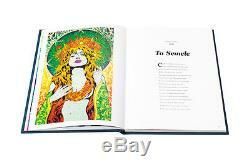 Printed and bound in the United States. 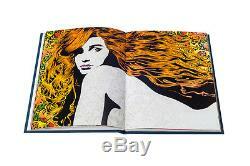 The item "Chuck Sperry Signed Helikon Muses Book Gold 1st Edition Rare #/500" is in sale since Sunday, March 18, 2018. This item is in the category "Art\Art Prints". The seller is "panicfania" and is located in Asheville, North Carolina. This item can be shipped to United States, Canada, United Kingdom, Denmark, Romania, Slovakia, Bulgaria, Czech republic, Finland, Hungary, Latvia, Lithuania, Malta, Estonia, Australia, Greece, Portugal, Cyprus, Slovenia, Japan, Sweden, South Korea, Indonesia, Taiwan, South africa, Thailand, Belgium, France, Hong Kong, Ireland, Netherlands, Poland, Spain, Italy, Germany, Austria, Israel, Mexico, New Zealand, Philippines, Singapore, Norway, Saudi arabia, Ukraine, United arab emirates, Qatar, Kuwait, Bahrain, Croatia, Malaysia, Chile, Colombia, Costa rica, Dominican republic, Panama, Trinidad and tobago, Guatemala, El salvador, Honduras, Jamaica, Antigua and barbuda, Aruba, Belize, Dominica, Grenada, Saint kitts and nevis, Saint lucia, Montserrat, Turks and caicos islands, Barbados, Bangladesh, Bermuda, Brunei darussalam, Bolivia, Ecuador, Egypt, French guiana, Guernsey, Gibraltar, Guadeloupe, Iceland, Jersey, Jordan, Cambodia, Cayman islands, Liechtenstein, Sri lanka, Luxembourg, Monaco, Macao, Martinique, Maldives, Nicaragua, Oman, Peru, Pakistan, Paraguay, Reunion.